I caught the replay of the post Waste Management GC coverage this morning. I don’t often agree with Chamblee but he made a comment when talking about Rickie and the events that took place on 11 and walking towards 12 and iirc after tee shots on 12. He said that is why CEOs love him. Because he didn’t slam a club, curse or throw any tantrum basically. He even joked with the main rules official after the hole and on 12. I completely agree with him and it’s something that has always stood out with Rickie. He has a love for the game and it’s history. Wearing knickers at Pinehurts in tribute to Payne Stewart, the use of the stand bag at the US Open and many occasions since. He also gets it from a fan and branding perspective. He represents all his sponsors with class and never forgets the fans. He wears a bracelet a sick fan gave him. He takes time to sign every autograph after the round and talk with fans...I witnessed first gah at Congressional several years ago during Tigers tourney there. He apologized when media obligations prevented him from gettiing out to sign autographs. Prior to this event and it may still be true that Bryson was getting the attention for his success and even garnering the “is he the new face of the brand” type of attention. Yesterday solidifies it’s still Rickie for all the reasons mentioned. We’ve seen Bryson slam a club at least twice, look like a spoiled brat on multiple occasions and try to make the USGA and R&A look foolish for the drop from knee height while in Hawaii with his antics of making it look harder and more confusing than it really is just to prove a point. He's my favorite player for a number of reasons, and my 2 year old son is becoming a big fan of his and I couldn't be happier. Rickie is all class and he is loved by the entire tour. He sticks around on Sundays and congratulates the winner when they come off the 18th and when Rickie finally wins his major, it wouldn't surprise me if half of the field is waiting to congratulate him him when he comes off of the 18th green. Rickie is a class act! You can get a sense of how someone is by how peers react to them and treat them. Rickie is obviously well liked by his peers on Tour. Which suggests he is genuine. The Rickie we see is the same Rickie they see. He honors the history of the game in ways his peers are often too self-absorbed to do. He also honors his parents and grandparents in ways that isn't common among his peers. That isn't common in this world. We need more like him in all walks of society. I became a fan when he went on his finishing 2nd place in all the majors run. He makes a lot of the guys out there look like jackasses. I don’t think we’d ever hear him yell T a camera man in. EuropeanTour event to stop messing with coins in pockets and not hitting till you leave. Or I don’t think he would tear up the greens, throw clubs into the woods. Great role model for kids, and adults alike. Now I hope he gets the green jacket he deserves and should have gotten last year. Absolute favorite player on tour, and he really knows how to celebrate a win. Can't wait for the young man to finally get that major he's been chasing. I was fairly ambivalent toward before, but watching him yesterday, he gained me as a fan. He was a true class act following 11 and that showed some true character and mental fortitude. He is really leading by example on tour. Good for him, and I hope he gets a major this year! I'm another that wasn't initially a Rickie fan. All the bright colors and long hair (nothing against long hair, pretty sure mine was much the same around that time), just made it feel like he was some "surfer dude" trying to play golf or something IDK. Anyway, it just didn't quite click for me until 2013 or 2014 - I can't remember if I actually started liking him before or after he placed so well in all the majors (2014). Regardless, I've been a fan for at least 5 years now and he never ceases to impress with his game or with his attitude and composure on the course. He's great with fans, great with charities, and just seems to have his priorities in order. I even remember a snippet from a few years ago about Arnold Palmer and how Rickie even took to heart Palmer's advice on how to do autographs. I can't recall what exactly was said, but something to the effect of making sure your autograph looks good so your fans can better appreciate it. I actually like Ricks “surfer” look. I know I blab on about traditions and stuff. But man, but the relaxed look is growing on me. Dig the untucked shirts. Looks better than J. Daly’s attire. Not every tournament should have an untucked feel. But in Hawaii and California, you bet. I hope he wins 3-4 times this year. I liked Rickie when he came out on tour. He was said to be aggressive and fearless. At the WMPO in 2010 he was in the fairway on #15 with a chance to win and decided to lay up rather than go for the green in two. Made par and lost. I thought that wasn't aggressive, and I still think that if he had gone for it and won that tournament, his career would look a whole lot different. I believe he would have had a couple of majors by now. Well, yesterday he went for that green in two from further back than he was in 2010 and made a much needed birdie. It was reminiscent of his shot at #16 at The Players. He needed it. When he won The Players sticking it to those that said he has underachieved, I thought his career had turned around. Not yet anyway. Maybe with this win, he will finally be able to close the deal on Sundays, now that he has proven to himself that he can do it. He has an "army" like Arnie did because people love him for all the reasons stated in other posts. You just want to root for him, not against him. I love his attitude. He's good and he knows it. He just needs to learn to play on Sundays like he does Thursday, Friday and Saturday. Major props to Rickie for continuing to show that you can have a great career on tour and be fan friendly. I agree that he sets a great example for the young golfers to look up to. The mental fortitude that it took to crack a joke with the official after the debacle on 11 was such a great move to work on flushing the bad emotions. He showed that you can win by internalizing and controlling your emotions. While I personally appreciate a controlled outburst such as what JT or Spieth will show at times, it’s really fun to watch someone not outwardly react as well. I hope he continues to contend and win this season. Rickie should write the playbook to success for these new guys flooding the Tour. How to market yourself in a way that through your actions, you take care of the fans and focus on your game. Good work Rickie, keep having fun, its fun to watch you play well. Breaking news:....I'ts hard to win Majors , especially with the depth of talent that is out there now. That said, I can't imagine any victory that would be more popular than Rickie winning the 2019 Masters! 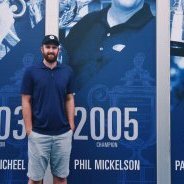 Possibly Phil finally winning the US Open for the career Grand Slam. What a summer that would be wouldn't it, if they both picked up those wins this year. And Tiger wins the Players, something mid season and a playoff event to grab the Fed Ex Cup. Greatest golf season ever in terms of TV ratings. It’s hard not to like Rickie. For me it’s hard not to like most golfers - they really have to work at making me dislike them. Sergio’s pretty much succeeded but other than him I’m okay with most. Rickie is a great example of how being a nice guy works very nicely in life. I’m very happy about his win and hope it’s the start of a nice run that includes a major this season. It's not that I didn't like the look necessarily, it's just that it made it difficult for me to take him seriously as a golfer until I began to learn more about him.His shirt at Torrey Pines was awesome. I'd love to see more companies introduce shirts like that in a variety of patterns. I like the high-tops too - seriously considering buying some - but not so crazy on the joggers. I’ve been eying up the G4 hightops. Takes me back to my skate/BMX days. I’m surprised Vans or DC haven’t made some golf shoe. I know there was a limited run of some Vans at one point, but impossible to find.